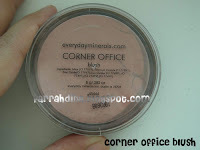 description of corner office from the everyday minerals website: A medium iridescent pinky peach with apricot shimmer. this is the most muted blush that i have so far. in the jar, you can't really see the shimmer and it looks very much like a matte blush. the shimmer becomes apparent only after the blush has been swept on to the skin. the colour seems ot be more pink than peach for me, and the shimmer is quite muted as compared to my wake up call. the colour blends quite nicely into my skin, so it didn't really look as if i was wearing blush. it gives a nice rosy glow to my skin which suits me just fine as i'm always afraid of looking like a punch-and-judy doll with two red circles on my cheeks. verdict: a colour that i would be comfortable wearing everyday for work, when i'm in too much of a rush to want to be bothered with careful and precise application.